The Crown of Rus, also known as the Crown of Kingdom of Galicia–Volhynia, is the crown with which Daniel of Galicia was crowned in 1253 by a papal archbishop in Drohiczyn. The crowning of Danylo Halytskiy is a debated topic, most historians landing around the year 1253, but the specific date is not known. Historian Mykhailo Hrushevsky wrote that the coronation took place in 1252, Vladimir Pashuto considered the date to be around 1254, and Mykola Kotlyar gives the year 1253. The crown is believed to have been lost. However, there are many speculations on where it might be located, including Poland, the Vatican, the United States, and Russia. Polish historian Eugeniusz Misiło [pl] believes that the crown was converted into a miter for Greek Catholic bishops in Peremyshl and searches for it in Polish monasteries. After Ukrainian independence in 1991, work began on a replica, based on the drawings and historical data by the jewelers from Kiev and Western Ukraine. The crown was finished in 2000s and now part of a permanent exhibit of the Zolochiv Castle in Western Ukraine. ^ a b Chapuha, Stepan (19 August 2003). "Where is the crown of Danylo Halytskiy". Halychyna newspaper (in Ukrainian). Retrieved 1 September 2014. ^ Makhun, Serhiy (12 December 2001). "The Crown of Danylo Halytskiy". The Day (in Ukrainian). Retrieved 1 September 2014. Galicia is a historical and geographic region between Central and Eastern Europe. It was once the small Kingdom of Galicia–Volhynia and later a crown land of Austria-Hungary, the Kingdom of Galicia and Lodomeria, which straddled the modern-day border between Poland and Ukraine. The area, named after the medieval city of Halych, was first mentioned in Hungarian historical chronicles in the year 1206 as Galiciæ. In 1253 Prince Daniel of Galicia was crowned the King of Rus or King of Ruthenia following the Mongol invasion in Ruthenia. In 1352 the Kingdom of Poland annexed the Kingdom of Galicia and Volhynia as the Ruthenian Voivodeship. 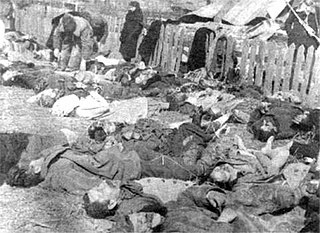 The massacres of Poles in Volhynia and Eastern Galicia, was an ethnic cleansing and genocide carried out in Nazi German-occupied Poland by the Ukrainian Insurgent Army against Poles in the area of Volhynia, Eastern Galicia, parts of Polesia and Lublin region, beginning in 1943 and lasting up to 1945. The peak of the massacres took place in July and August 1943. Most of the victims were women and children. UPA's methods were particularly brutal, with many of the victims being tortured and mutilated, and resulted in 40,000–60,000 Polish deaths in Volhynia and 30,000–40,000 in Eastern Galicia, with the other regions for the total about 100,000. The Ostrogski family was one of the greatest Polish-Ruthenian families of the Grand Duchy of Lithuania. The family spanned from the 14th century to the 17th century. After the death of the last male heir of the Ostrogoski family, Janusz Ostrogski, most of the family's possessions were passed to the Zasławski family. Zolochiv is a small city of district significance in Lviv Oblast of Ukraine, the administrative center of Zolochiv Raion. The city is located 60 kilometers east of Lviv along highway H02 Lviv-Ternopil and the railway line Krasne-Ternopil. Its population is approximately 24,269 (2017 est. ), covering an area of 1,164 km2 (449 sq mi). Western Ukraine or West Ukraine is a geographical and historical relative term used in reference to the western territories of Ukraine. It includes several actual historical regions such as Transcarpathia, Halychyna including Pokuttia, most of Volhynia, northern Bukovina as well as western Podolia. Less often it includes territories of eastern Volhynia, Podolia, and small portion of northern Bessarabia. Important cities are Buchach, Chernivtsi, Drohobych, Halych, Ivano-Frankivsk, Khotyn, Lutsk, Lviv, Mukacheve, Rivne, Ternopil, Uzhhorod and others. Western Ukraine is not an administrative category within Ukraine. Leo I of Galicia was a Knyaz (prince) of Belz (1245–1264), Peremyshl, Halych (1264–1269), Grand Prince of Kiev (1271–1301) and King of Galicia-Volhynia. Bolekhiv is a regional city in Ivano-Frankivsk Oblast (province) of Ukraine. It was once home to a large Jewish community, very few of whom survived World War II. Administratively, Bolekhiv is incorporated as a city of regional significance. Population: 21,610 (2016 est.). Duchy of Belz or principality of Belz was a duchy, formed in the late 12th century in Kievan Rus. During its history the duchy was a constituent part of some other political entities such as the Kingdom of Rus, the Kingdom of Hungary, Duchy of Masovia when eventually in the late 14th century was incorporated into Poland becoming later the Bełz Voivodeship. Sasiv is a town in Lviv Oblast, Ukraine, since 1945. Until 1772 the town was located in the historical territory of Ruthenia, in the Ruthenian Voivodeship of the Crown of the Kingdom of Poland, thereafter until 1919 became part of the Austro-Hungarian Cisleithanian crown lands in the Kingdom of Galicia and Lodomeria (Galicia). From 1919 until 1945 the town was once again part of Poland within the Tarnopol Voivodeship. The town is located 8 km north-east of Zolochiv on the west bank of Western Bug River. Dmytro Dedko was a Lord of Ruthenia in 1340 (1323) – 1349. Commonly thought to be a Galician boyar, he could be one of sons of Yuri I and Varvara (Barbara). Dmytro is possibly the progenitor of Ostrozky family.